Four years ago, standing on stage in front of journalists and employees, Apple CEO Tim Cook announced an all-new Apple TV, promising to bring the living room into the app age. “We believe the future of TV is apps,” Cook said. In an uncharacteristic misstep, hindsight has proven Cook to be wrong. But when the latest Apple event begins streaming at 10 a.m. Pacific, 1 p.m. Eastern on Monday, March 25, don’t expect him to admit the error. Instead, keep your AirPods tuned to what’s left unsaid as Cook reveals what many expect to be new streaming video and subscription news services. Since that 2015 Apple event, little has happened on Apple TV’s tvOS, but a lot has been learned. Sure, the little black box with the interface Steve Jobs dreamed up made it much easier to navigate menus and catalogs with voice commands on the Siri Remote. But reasons for consumers to buy an Apple TV instead of competing products never fully materialized. Was flipping through Zillow’s home listings better on an Apple TV than an iPhone? Users (or lack thereof) proved it was not. Were the casual games that thrived on iOS better on a bigger screen? Not necessarily. But could you watch Netflix, binge on Amazon Prime Video, or cut the cord entirely and stream cable programming instead? Yes, yes, and yes. Today’s tvOS App Store rankings show just how much streaming video dominates Apple TV. Of the store’s top 20 grossing apps, the only downloads that aren’t video apps are the game Minion Rush and the exercise app Zwift, proving that the most popular (and some may argue only) use for Apple’s television product is, well, watching television. This should surprise neither Apple nor consumers. According to a recent survey by Digitas, 34% of respondents said that video subscriptions have become indispensable to their lives. That’s a remarkably high mark in a still developing space, and just a tick under the 35% who said the same of music services like the now ubiquitous Spotify. And it’s also evidence of what’s become clear since Cook made his false apps prophecy: The future of TV (and of the Internet, as Apple will subtlety posit) is not apps, but subscription services. Just look at how the Internet has changed the world since 2015. 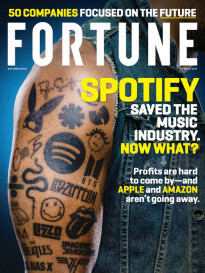 People have stopped buying music, and instead now subscribe to it. Ride-hailing apps like Uber and Lyft have brought transportation-as-a-service into the mainstream. From Blue Apron to Stitch Fix, Pill Pack to Dollar Shave, people are subscribing to companies to manage the mundane details of their lives. And Apple, in its own right, has also done well in the services space. The company’s services revenue has more than doubled from $5 billion in the last three months of 2015 to $10.9 billion in the first quarter of 2019. Encompassing everything from Apple Pay transactions to iCloud storage accounts, Apple’s services category has notably lacked the income generated by streaming video that other companies have. And for perspective of how big a missing piece that is, consider that in the most recent quarter, the company’s 50 million paid Apple Music subscribers pushed the iTunes Store’s revenue to its highest level since it started selling $.99 tracks some 16 years ago. If Apple had pushed into streaming video several years ago, there’s no telling where it would be now. But in the interim, streaming television services like DirecTV Now and YouTube TV have yet to find their footing (or loyal customers) anyway, which means it’s not too late for Apple to make a splash. The web is a mass grave of inaccurate, pre-Apple event predictions, so it’s silly to forecast details about what Cook will announce in the Steve Jobs Theater on Monday. But if the most frequently echoed rumors are to be believed, Apple will offer its family-friendly video titles to owners of Apple devices for free, while offering to bundle à la carte subscriptions through its easy-to-use TV app interface. Are Oprah Winfrey and Steven Spielberg, two high-wattage names who have signed up to produce Apple programming, enough to turn the company from a no-show to a show-stopper in streaming video? Probably not, but who’s to say? But if you add in Apple’s successful track record of selling other companies’ content—as it did for years with music on iTunes, along with its middling success peddling video subscriptions on Apple TV—and the 1.4 billion Apple devices in use today, its video push could grow quickly and make the company a major player. Meanwhile, Apple’s expected “Netflix for news” product is flying under the radar. 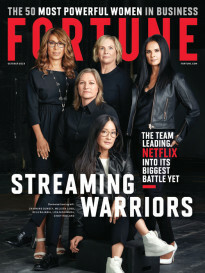 While it may not generate as much excitement as the reported forthcoming streaming video service, its concept is similar—it’s just the medium that’s different. Under the name Texture, the startup that Apple bought in March 2018, subscribers are already able to access more than 200 magazines for just $9.99 monthly. In 2016, Texture already had “hundreds of thousands” of subscribers, despite a relatively wide-open Internet that let people read practically anything they wanted without paying. When your competition is “free,” gaining that many subscribers deserves applause. But as Facebook and Google have choked publishers’ online ad revenue, publications have begun looking for other ways to make money. Encouraged by successful subscription-based readership gains at The New York Times, the Washington Post, and WIRED, among others, expect more newspapers and magazines to create paywalls of their own. And to get access to a fraction of Apple’s massive customer base—like its 900 million active iPhones, or its 850 million iCloud users—it’s likely attractive to the news media to sign on to Apple’s offering. Think about what you do online these days. According to Nielsen, 11 hours of your day are spent interacting with media. An increasing amount of that content has not only moved online, but also behind paywalls. Paired (and announced) together, Apple’s new streaming video and subscription news services have the potential to recast the web as we know it. But to find out how this story ends, you’ll have to pay to subscribe, because Apple and its partners definitely aren’t going to give it away for free.